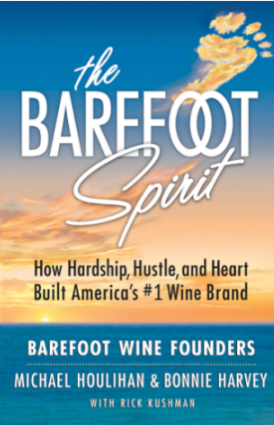 Last month I spoke with Barefoot Wines founder Michael Houlihan about his upcoming book The Barefoot Spirit (Evolve Publishing – May 2013). 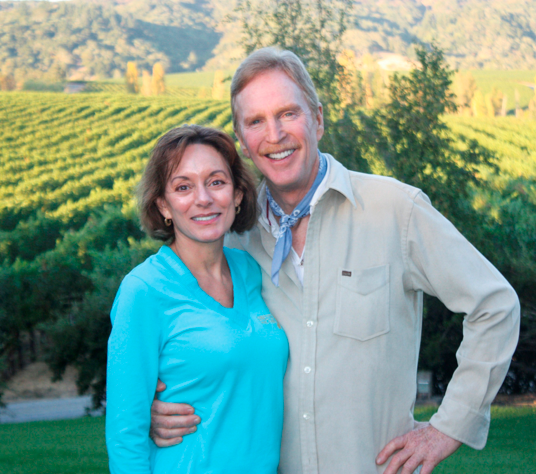 Michael, who has been in the wine industry for nearly 30 years along with his life and business partner Bonnie Harvey, created the affordable and ubiquitous wines we know from the cute footprint icon. As soon as I spoke with him, I knew I liked him. He’s engaging, modest, enthusiastic and plain speaking, and considered a wine industry visionary. Though there are better known trailblazers throughout the history of California wines – perhaps none have started out more hapless, or dare I say clueless. He’d be the first to admit it. When Michael and Bonnie hatched their idea to produce wine out of their farmhouse laundry room in 1985, they were so unaware of the vagaries and complexities of the business that they didn’t even know that wine came in different sized bottles. And though Bonnie had a nose for business and Michael had a knack for sales, they couldn’t possibly foresee what it took to make and sell wine on a grand scale. But both kept an open mind and both were quick studies. As he describes it in his light-hearted and informative book, Michael started his sales adventures by lugging samples of Barefoot wines through a blinding thunder storm to the Piggly Wiggly in South Carolina – hardly an auspicious beginning. Neither one of them was knowledgeable about such crucial details as marketing, distribution and shelf placement, and they were sticker-shocked when they discovered the high cost of glass to bottle their wines. The term ‘spiffs’, which are legal bonuses given to distributor reps to push a wine, was not in their vocabulary yet. They just had a product they believed in and a commitment to see it through. Michael remembered what one wine purveyor told him, “You’ve got to be better and cheaper than Bob.” Mondavi, that is. So they put their heart and soul into the venture and learned along the way. Turns out they learned a lot. “The Barefoot Spirit” is the polar opposite of a dry business-oriented tale of success. It’s about a pair of entrepreneurs who dropped everything, except their commitment to fun, to make and sell an affordable wine. I mean who wouldn’t love a pair of nature-loving, beach-combing winemakers who think there’s nothing better in life than hiking the Sierras with their cats and treating their business like an adventure. Now that’s a tale you wouldn’t want to miss. “We have to arrive at an unfashionable time,” I insisted. “The minute they open the doors!” Like everyone else I’ve been put off by Toki Underground’s rumored lines-around-the-block and their no-reservations policy but my accomplice and I were determined to check out all the noise. Certainly the restaurant’s 2012 DC “Restaurant of the Year” award has the trendoids beating a path to their door, but we weren’t going to let that stand in our way. So around five on a weeknight, I picked up my epicurean compatriot and we headed off to H Street where we discover to our delight that we are seated right away. Toki Underground has been on the radar screen of foodies and chefs from Alice Waters to Joan Nathan whose famous Sips & Suppers event featured the noodle shop’s Executive Chef Eric Bruner-Yang in one of their private dinners this year. The tiny noodle house, all 650 square feet of it, has a mere twenty-five stools and most face the wall. Don’t expect a romantic hideaway or group ramen night. This hot spot could be more fondly described as a hole in the wall. The tiny outpost sits above The Pug, a small dive bar on the first level. A steep stairway leads to the second level and the unmistakable aroma of miso, soy and freshly made ramen. (Why “Underground” if it’s on the second floor?) A tattooed host leads us past clouds of billowing steam from the open kitchen where we hop onto two empty stools, propping our feet up on the footrests, actually repurposed skateboards, and dive into the menu like starving cheetahs. The décor is Asian animé hipster – the limited menu Japanese/Taiwanese fusion ramen and dumplings complimented by Asian-themed cocktails, sake and Korean beers. But it’s the ramen, lovely silken noodles made off premises in Springfield, VA to Bruner-Yang’s specifications and floating in a 24-hour simmered pork shoulder bone stock, that steals the show. Though there are a purported twenty-six different styles of ramen, the young chef draws on his life in Taiwan watching his mother and grandmother form the flour and water into pliable strands to interpret his own style. The proper way to eat ramen is to slurp. (Miss Manners, cover your ears!) The reasoning behind this custom, uncouth to Western proprieties, is to aerate the noodles in order to eat them quickly before they break down in the hot broth. Lots of communal slurping was heard. Dainty diners need not apply. Our dumplings come first, steamed instead of pan-fried and the soft pillows, stuffed with ginger, scallions, Napa cabbage and a house-made spice mix, and served alongside tare, a sweet soy dipping sauce. A classic hakata follows – the bowl filled to the brim with ramen, pork loin, pickled ginger and nori seaweed. My partner likes the nitamago with the sous vide cooked egg that when broken spills into the broth turning it into a creamy slurry. 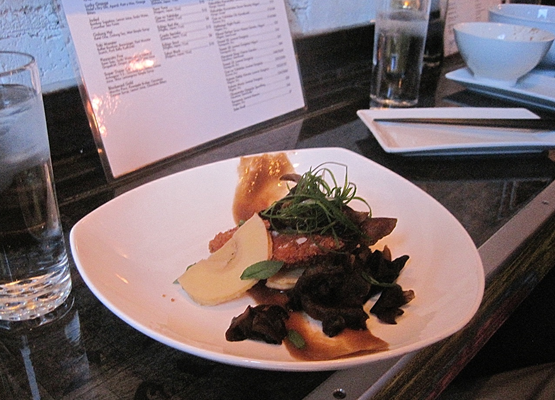 If you’re of a mind, Chashu pork cheek or other additions can be added to most dishes with a nominal $4 surcharge. All the ramen bowls are layered with complex seasoning and spice and cradled by the deep undertones of the slow cooked pork bone stock. Dessert is an afterthought here with house made chocolate chip cookies and a carafe of milk. Take it or leave it. If you want something more substantial you may want to drift over to Dangerously Delicious Pies for a slice of heaven on a plate. Currently in the works is Bruner-Yang’s experiment to channel the Asian night market experience. 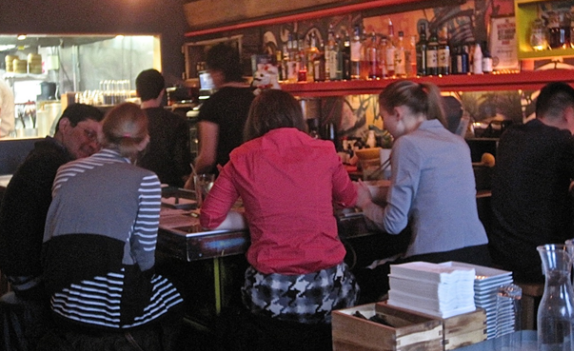 Look for Maketto to bring the same energy and intriguing cuisine to his revered H Street neighborhood. 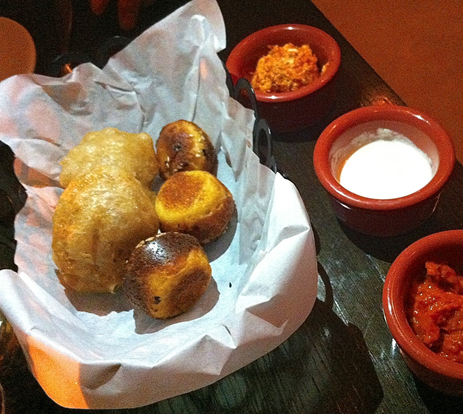 It was last November and a small group of us were brunching at Masa 14, when I first heard about Ambar. Ivan Iricanin and his partner, chef and restauranteur Richard Sandoval (Masa 14 and El Centro D. F.) had already begun building out the Eighth Street restaurant that would soon transport the soul-satisfying regional dishes of Serbia’s Balkan republic to DC. 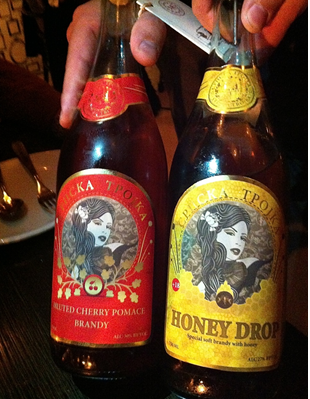 In particular they were excited to debut dozens of varieties of the country’s national treasure, rakija, which are fruit brandies of a wide-ranging potency. My antennae were vibrating like a summertime cicada. In January the two-story brownstone opened with three authentic Serbian chefs and bar shelves filled with glistening bottles of rakija sharing space with wines from Slovenia, Bulgaria, Croatia and Serbia. It’s a cozy country rustic space yet with a modern polish. Mason jars of pickled eggs and vegetables take up shelf space with books and candles flicker against the pickled wood walls. The cuisine here is a heavenly mixture of Mediterranean, Balkan, Turkish and hearty Slavic fare – a bit spicy, earthy and deeply flavored, especially the meats. Scanning the menu I saw a multitude of intriguing dishes – Wild Mushroom Salad salata sa pecurkama, White Veal Soup teleca krem corba, Venison Carpaccio karpaco od smetine. But it was the way they were described that made us lean in further. A dish called simply ‘Grilled Asparagus’ is done up in a velouté sauce with crispy prosciutto, pumpkin, purple potato and quail egg. Beet and Goat Cheese Salad, slojevi cvekle arrives garnished with pork cracklings, walnuts and chives. 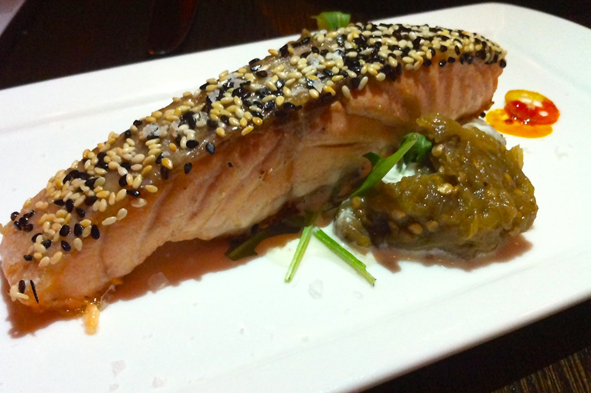 Sesame Crusted Salmon, losos, is flavorfully enhanced by horseradish sauce and spicy eggplant jam. It seemed impossible to decide but after giving our preferences to our capable and quite adorable server, she made a few suggestions and additions to complement our initial choices. The homey Bread Basket ustipci ili proja is a good place to start. Filled with the Balkan version of cornbread, fried sourdough, (be still my heart) and three savory spreads, the one most of us are familiar with is ajvar – a spicy red pepper puree. We also swooned over the Cheese Pie gibanica – a delicately layered phyllo napoleon with spinach and goat cheese, far better than most I’ve tried. Though they have the traditional beef and pork kebabs cevapi, which adds cheese to the skewer and the National Dish pljeskavica, a Balkan hamburger – it was the Stuffed Sour Cabbage known as sarma that transported us on that cold, rainy evening. 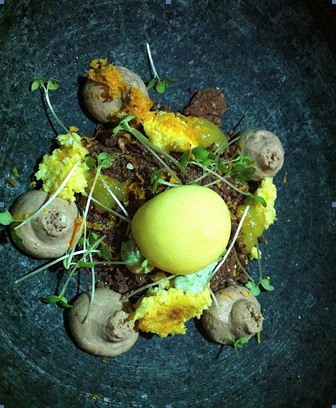 Ambar does not treat dessert as an afterthought. They have a pastry chef who trained in kitchens throughout Europe. The most unusual dessert is the Forest Gnocchi. Dazzlingly presented in an earthenware bowl that weighs as much as a bocce ball, its separate components consist of chocolate mousse, bitter orange cake, ground chocolate, orange gelee, tarragon gnocchi and passion fruit espuma. The unusual dessert, pretty as a medieval garden, is then stirred up with black tea sauce. Be sure to finish with one of the rakijas. We opted for the subtle Honey Drop and the high octane Cherry Pomace. Just the beginning of our love affair with Ambar.